I signed up for my first ultramarathon on a whim. 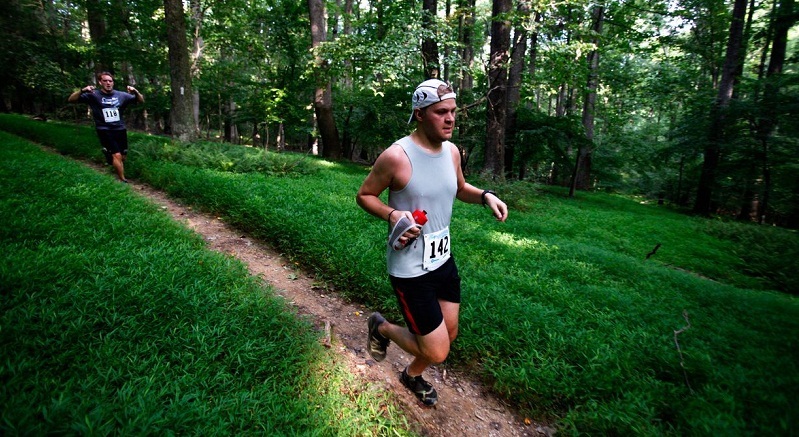 I had just experienced my first trail race, an 8k at a state park in Maryland, which was so much fun that I couldn’t drop the idea of running a long distance trail race. It was just a few days after that 8k that I was online registering for the North Face Endurance Challenge 50k outside Washington, DC. “It’s just a few miles longer than a marathon. No problem!” I distinctly remember telling my now wife when I told her what I had done. I treated the next few months leading up to the race like I was training for a marathon, complete with speed work and long road runs. I found a 50k training plan online, which I glanced at every few weeks, but mostly stuck to what I was familiar with: marathon training. The only exception being that I did spend a lot of time running trails. At least I was smart enough to do that. I finished that 50k, but looking back, I’d call it anything but a success. I hurt like crazy, had blisters so bad I couldn’t wear shoes for the next several days, and doubted I’d ever run another ultra again. It wasn’t the experience I was looking for. As time went on and I met new ultrarunners, I started learning from their advice and discovering the many things I had done wrong. And as you know, I have indeed run several ultramarathons since. But I’ll never forget how humbling that first 50k experience was. And how naive I was when I toed the line. I know I’m not alone when it comes to unprepared first ultramarathoners. In preparation for the soon to be released Discover Your Ultramarathon, a beginner’s guide to running ultras, I spoke with dozens of ultrarunners, some with more than 50 ultramarathon finishes, and nearly all of them say they that their first ultra was littered with naive mistakes. 1) Nutrition is very important. One of the biggest differences between road marathons and trail ultras is the need to stay on top of nutrition. Trail 50ks can take several hours longer than your marathon PR, so while you might be able to get by with an energy gel and a few gummies during a marathon, runners need a lot more fuel during an ultra. Five hours into my first ultra and I was starving. I had no nutritional plan going into the race, and the energy gels and pretzels I had been eating just weren’t cutting it. So I did want any hungry runner without a plan would do, and gorged myself on aid station food until I felt full. Guess what? Eating all that food meant I went from hungry to feeling bloated and sick. Not what I wanted with over 10 miles left in the race. It’s important to know how to fuel properly, test out your nutrition plan on long runs, and utilize the plethora of available foods at aid stations. 2) Pacing is equally important. Even splits and negative splits are a huge part of marathon racing. Knowing your pace ahead of time, following a pace group, and tracking GPS stats are practices I always do throughout a marathon. Ultras are a different story. Pace can vary wildly depending on the difficulty on each section of trail and the elevation changes that come along with mountain races. Ultrarunners pay more attention to effort than they do pace, something I had no experience with during that first 50k. 3) Energy comes from different places during an ultramarathon. Road marathons are often crowded with runners and lined with spectators ringing cow bells and holding signs. The noise and excitement can be a lifeline for someone struggling late in a marathon. Ultramarathons, on the other hand, are often much smaller, and course limitations mean you may not see a spectator for miles. For most ultrarunners, that usually isn’t a problem. The energy comes from the environment they are running through, the welcoming community of fellow runners, and the challenge of the incredible task at hand. Setting your expectations will keep your head in the right place. The first real hill comes somewhere around mile four of DC’s North Face Endurance Challenge. When we hit that hill, I was immediately struck by how quickly every other runner started walking. Walking? At mile four? What are they doing? I zoomed past everyone up the climb. By mile 25, probably every last one of those runners had long since passed me. This goes back to your ability to pace properly and maintain a sustainable level of effort, not speed. I wish I had trained myself ahead of time for those walking sections, and practiced power hiking up hills. I made a lot of mistakes during that first ultramarathon. A lot more than just those four. And I’ve made many more in the ultramarathons since. Which is precisely the reason I decided to write the beginner’s guide to ultrarunning, Discover Your Ultramarathon. I want the mistakes I made, and the lessons I learned from them, to keep you from suffering as much as I did. So that when you run your first or next ultramarathon, you can cross the line excited about your achievement. Not cursing it. Trail ultras are a completely different beast than road marathons, and they should be treated as such. If there was just one piece of advice I wish someone had told me before that first ultramarathon, it would have been to do my research, learn from the friendly community of ultrarunners with experience, and prepare with proper training.